Looks like security equipment manufacturers have found the answer to not only scarring away burglars but also annoying them terribly. 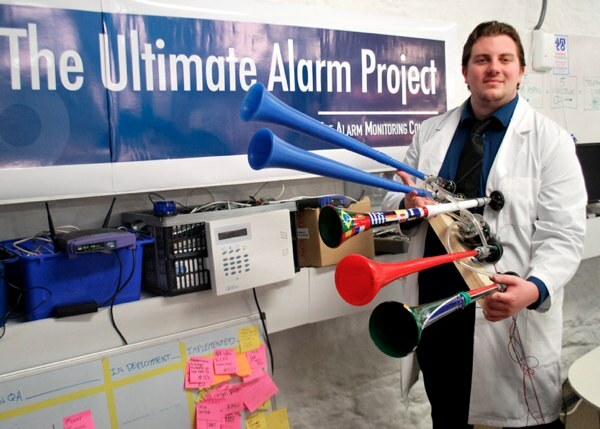 A United Kingdom based alarm monitoring company has developed what it claims to be the world’s most annoying alarm and we don’t disagree. The VuVutech 5000 is what the company says will not only scare but also annoy the burglar into giving up. The alarm system has the AMCO alarm to which five powerful air horns topped off with a vuvuzella. A deadly combination indeed. This whole setup is attached to a telephone monitoring service and will trigger 135 decibels of vuvuzella fury on the unsuspecting intruder. Previous ThinkGeek Clearance Sale On!